Traditionally, Prestige is one of football's early sets that really starts pushing the rookie content. Releasing a decent distance from the draft, 2015 Panini Prestige Football is no different. Hobby boxes average three autographs and one rookie jumbo patch card. On top of this are plenty of inserts and parallels that come together to form a massive checklist. Although the 2015 Panini Prestige Football base set brings the veterans, it's the rookie cards that are going to garner much of the attention. 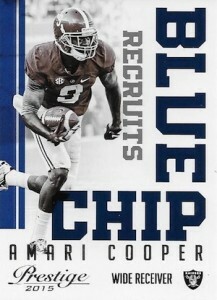 Every pack should have a rookie card. Taking advantage of their college licenses, collectors can expect to find first-year players in their NCAA uniforms. Sticking with the brand's past, all come with several levels of parallels. Purple, Gold, Platinum and Black are all numbered to 100 or less. Select rookies also have Photo Variations (1:6). Autographs come with a variety of designs and themes. Most carry some sort of rookie theme. 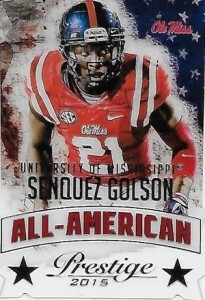 Next Day Signatures come with on-card signatures done at the NFLPA Rookie Premiere. In addition to these, collectors can find Rookie Signatures and Draft Pick Signatures. 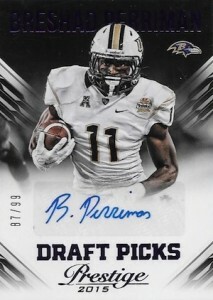 First Impressions Autographs highlight key players from the 2015 NFL Draft and are numbered to 99 or less. And while the majority of signatures in 2015 Panini Prestige Football come from the newest players in the league, there are veterans sprinkled in as well with Signatures. 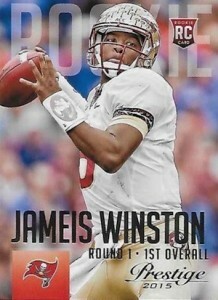 Rookie Jumbo Patch cards average one per box. Each has an over-sized swatch from a player-worn jersey. Acetate inserts make their presence known as well. Franchise Favorites (1:24) come the plastic card stock with a die-cut design to showcase some of the game's most popular players. All-Americans and Campus Legends bring a college flavor to the acetate lineup. 2015 Panini Prestige Football has no shortage of basic inserts. These include Blue Chip Recruits (1:12), Draft Big Board (1:12), Draft Picks (1:24), NFL Shield (1:24), Prestigious Picks (1:12), Road to the NFL (1:12), and Super Bowl Heroes (1:12). 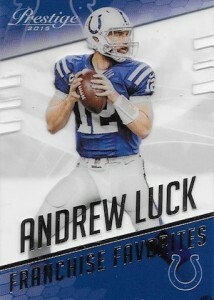 Hobby boxes include an over-sized Draft Picks card that's done with etched foil. 2015 KWON ALEXANDER PRESTIGE ROOKIE RC AUTO LOT OF 16 AUTOGRAPH #'D 10 49ERS NR! 40 cards. View a side-by-side comparison guide. 20 cards. Serial numbered #/249. Prestige will be the new Score. Dont understand the hate for sticker autographs — do people realize players dont have time to sign stacks of cards and then mail them back to the company ? If it werent for the stickers there would be tons of worthless base cards and no money to be made at all. patrick � Stickers weren’t around until after 2000 (can’t remember the exact year) and there were plenty of autographs available before then. In a lot of instances, many feel that stickers detract from the look of a card. 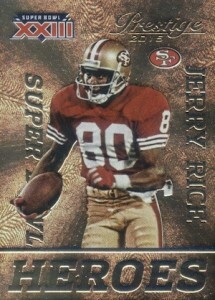 Some collectors also like the connection an on-card signature has to the athlete. The release is the 22nd right? Will the checklist be coming in a few days? Matt � Looks like it is now releasing on the 29th. I don’t know what these guys are talking about, these are all on-card with no redemption. I have already spent some coin on a few case breaks at the Nationals this week and can’t wait to see what I get! All 3 autos were late draft/undrafted no names. ALL STICKER autos…Best card was the non-numbered jersey card. Have to agree with shay….out of around 8 boxes….more than half of my autos were undrafted players….I got zero 1st or 2nd round picks…that’s just a complete rip off and waste of the money. Same with the Jersey cards…..nobody in the first two rounds. 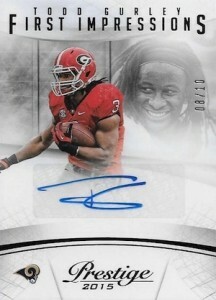 I saw 3 cases opened today and there was exactly one good card pulled….a Todd Gurley Auto printing plate. The base card design is generic and plain so if you can’t pull good rookie autos or patches then what’s the point of buying? I can wait a few weeks and pick up sets for $20 to $30 vs paying $89 for a box with crap hits. Buyer beware…another Panini product that guarantees you will lose 50% to 75% of your purchase price the minute you open the box. Overall I like this product but only opened one box thus far. Pulled a 4 color Melvin Gordon jumbo patch. Every box has an oversized rookie card inside and I got Amari Cooper. Sold it for $10 and probably could’ve gotten more. The 3 autos were Deontay Greenberry, Ronald Darby/50, and Dorial Green-Beckham. What I like about this product are the foil inserts which are very attractive and easy to sell. I did well with them pulling Winston, Cooper, Gurley, Emmitt Smith, and Montana. They should bring between $5-$10 each. The parallels were disappointing as you only get four and just two are #’d. I got Written/100 and Patrick Petersen/25 but it was dinged. The rookies are pretty scarce which should make them more valuable and I pulled a Winston there as well. The Gordon was the best pull of the day but not sure why it’s not #’d considering it’s a 4 color patch. I will more than likely buy this product again. Don’t understand the hate. Every set has some crap autos. I have been in a couple of breaks and have already seen a winston auto/25, mariotta patch, kevin white auto, devante parker auto, and a Perriman auto. They only complaint I would have is that there is too many different insert sets. Overall I think it is a very decent value. HORRIBLE collation in this product. Busted six boxes and some extra packs and was four cards short of the base set. On the rookies missing so many numbers it is not even funny but then you get five or six cards of the exact same player. Very, very poor job by Panini. Then you get to the autos, out of six boxes one rated rookie on card auto, one first rounder of a defensive player. Rest of the autos were fourth round or higher autos. The one saving grace in my break was a multi color base patch card of Winston. The other five patches, three cards the patches were 99% white. Very poor swatch selection. Basically a waste of over $600 at our local. Another collector at our local had the exact same result with this break, so I don’t think it is just me. This product is okay. The base design is pretty weak and the insert cards aren’t all that interesting either. I do appreciate that this is the first product that has NFL logos for the rookies. I also like the rookie photo variations which feature the rookies in their NFL uniforms for the first time. I opened one box and got a TJ Yeldon printing plate auto, which I subsequently sold for $95. So I made my money back in one card. However, I won’t buy any more boxes of it because it’s not really a product that I’m interested in putting sets together of base or insert cards, mostly because the designs are boring, in my opinion. Also, now that some other football products are hitting the market, you can get the rookies with NFL logos elsewhere. I bought 1 box, along with enough individual packs to probably fill another box. I think where Panini went wrong was having so many subsets. For the cards that everyone wants to know about, I pulled 5 etched foils from the full box, Jerry Rice, John Riggins, Mariota, Ameer Abdullah and Amari Cooper. Autographs have been Malcolm Brown(DT-NE), Levi Norwood, David Cobb, DeAndrew White, Kevin Johnson #/50, Landon Collins, Vic Beasley and TJ. 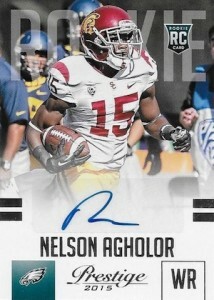 Yeldon #/25. For the Rookie patches, a 3 color Breshad Perriman and a 2 color Amari Cooper. Maybe I have better luck than others, but I think the rares I pulled are definitely better than most. It’s ok, But Panini could do better. I enjoy the college cards so I like the set because the photos used are nice and full bleed , also gives college collectors a good number of cards to chase with inserts and parallels , I get what people are saying about Panini though , as there are just far too many no name auto’s to warrant the asking price of the boxes. 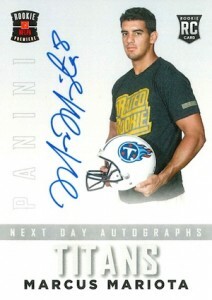 When was the last time Panini released a low to mid end product where the box prices went up after release? 2015 PANINI PRESTIGE FOOTBALL HOBBY BOX - 3 AUTOS PER BOX! WINSTON MARIOTA RCs!